Reason for Reading: Pullman’s trilogy got mentioned a lot when Harry Potter was brought up, and a girl needs something to tide her over until the sixth Potter book, doesn’t she? Synopsis: Lyra lives in a world much like our own, with a big exception being that each individual possesses a daemon in an animal form, Lyra’s being the shape-shifting Pantalaimon. While eavesdropping in a room of scholars, including her uncle, Lord Asriel, Lyra first learns about the mystical Dust, even though she can’t quite piece together what it is or what it does. There’s a suspicion that it has to do with the vanishing children in the area, and soon Lyra finds herself swept up in the mystery and adventure of a quest to the far north to discover the truth about Dust and the missing children. The Golden Compass is the first in the trilogy refered to as His Dark Materials, and is followed by The Subtle Knife and The Amber Spyglass. 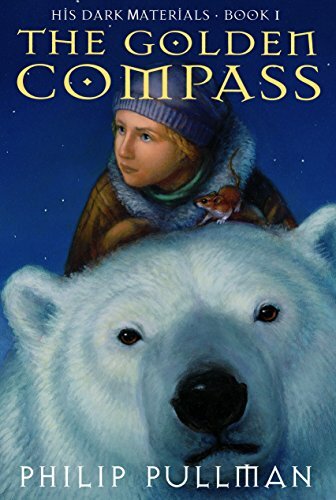 Why you should read this book: For a so-called children’s book, The Golden Compass leaves many, many books in the dust, including a lot of adult literature. Pullman isn’t afraid to throw some complexity into the idea of good vs. evil, and the book benefits greatly from this – it’s complexity that makes us human, after all, and Lyra and the other characters are practically jumping off the page they seem so real. Heck, even the talking bear has a formidable personality. Reading the book, you can imagine all of the usual turns another author’s novel might take – sentimental, lesson-learning, everyone changes for the better – but Pullman really lets the characters’ personalities influence their fate. Fun, suspense-filled, and unpredictable, the only thing better than reading The Golden Compass is the thought that there’s two more books to come. Why you should avoid this book: Don’t be discouraged if the first fify or so pages don’t have you completely mesmerized – it’s setting up the book for all of the action in the next 350 pages, and it’s worth the wait. If you associate the fantasy genre with dragons and swords (and consider that a bad thing), you have no worries with The Golden Compass. You will, however, have to be partial to talking animals and a very unusual world (and how hard is that, really?). The word female only suggested female Scholars to Lyra, and she involuntarily made a face. To be exiled from the grandeur of Jordan, the splendor and fame of its scholarship, to the dingy brick-built boardinghouse of a college at the northern end of Oxford, with dowdy female Scholars who smelled of cabbage and mothballs like those two at dinner! ‘What’s that mean?’ said John Faa, turning to his companion. ‘That’s a Greek word. I reckon it’s from aletheia, which means truth. It’s a truth measure. And have you worked out how to use it?’ he said to her. Also recommended: Harry Potter and the Goblet of Fire by J.K. Rowling; Harry Potter and the Order of the Phoenix by J.K. Rowling; The Bad Beginning by Lemony Snicket. Also by this author: The Subtle Knife; The Amber Spyglass; Lyra’s Oxford; Clockwork; The Tiger in the Well; The Shadow in the North; The Ruby in the Smoke; I Was a Rat!…or The Scarlet Slippers; The Firework-Maker’s Daughter; The Tin Princess; The Broken Bridge; The Butterfly Tattoo; Thunderbolt’s Waxwork; The Gas-Fitters’ Ball; The Scarecrow and His Servant; Spring-Heeled Jack; Count Karlstein; Puss in Boots; Mossycoat; Aladdin. Fun tidbit: Pullman had never done any professional illustrating until his publisher suggested having illustrations on the first page of each chapter, and Pullman volunteered to try it out himself. The American books only include the illustrations starting with the editions published in 2002.